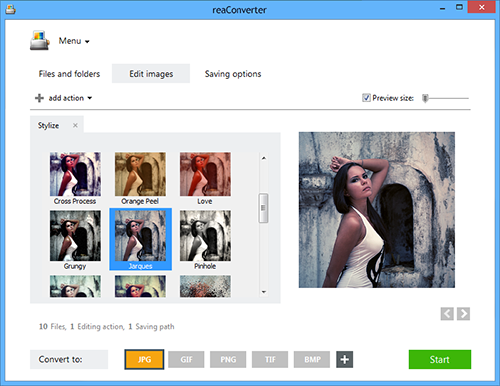 Whether you are a graphic designer who wants to stylize an image in order to use it for creating a print ad, or an amateur who simply wants to make Facebook profile image attract more Likes, reaConverter is equally effective in applying fast and simple image editing. 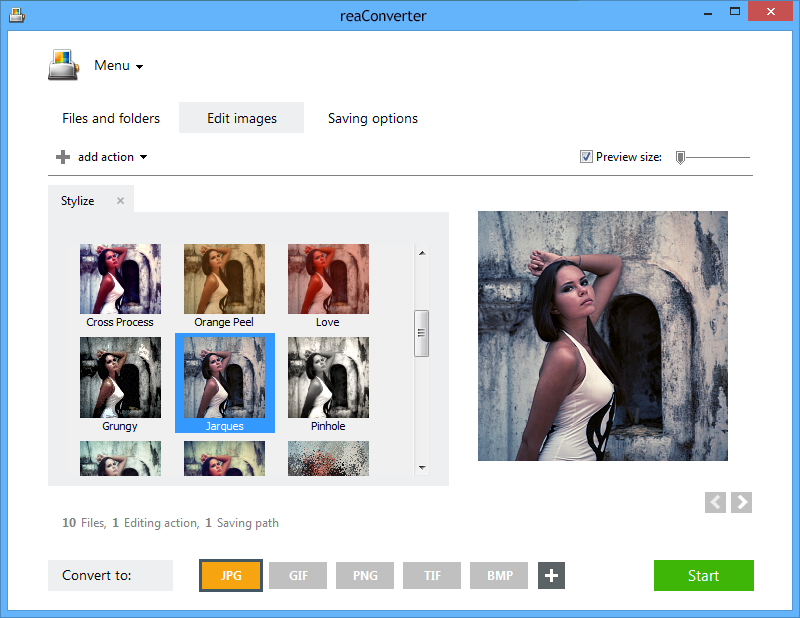 The software's Stylize tool offers a comprehensive set of 25 different styles that can be applied to an image in a matter of seconds to improve its visual impact. Add a classy vintage effect, improve clarity, add warm tones of orange or red, or twist the image to make it look funny — all these effects and several more can be tested in real time on your photos using reaConverter's preview feature. Try them all and customize intensity where necessary, so that you can quickly get a fresh set of stylized images that are ready to be published. Add one or more images you intend to stylize. 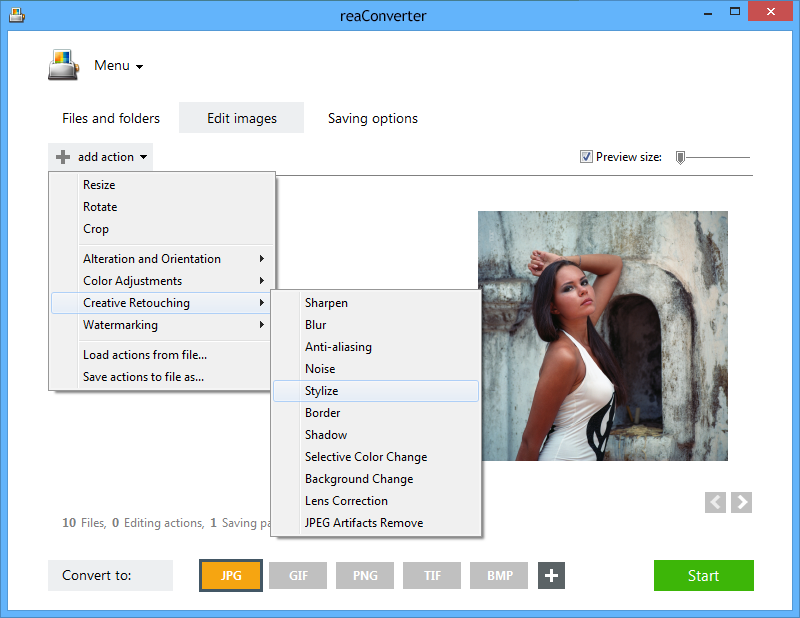 You can select them manually, add entire folders or use reaConverter's drag-and-drop tool. Here you will find a wide range of stylizing tools to ensure a high visual impact. Some include changing the color tones of the image — by customizing light and exposure, switching to black and white, adding shadows or making the photo look darker/lighter, while others imply the addition of abstract effects — such as Spray, Fisheye, Mosaic or Ripple. In the latter cases and in a few others, reaConverter provides a handy scroll bar to help you customize intensity. In the Saving options tab, pick a location for your freshly stylized images. 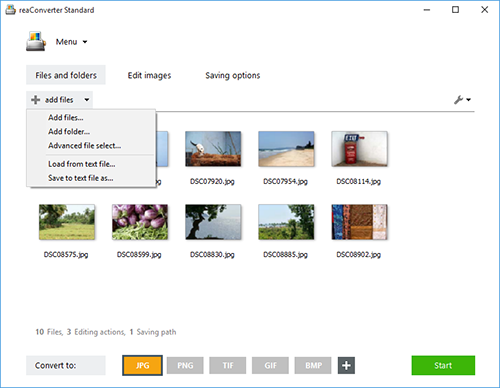 You can save them online or offline, as well as convert them to a new image format. Choose one of the available ones by clicking on the buttons placed in the lower part of the screen. Then simply press Start and your stylized images will be ready in no time! Command-line stylize tool is an advanced feature meant for professional use, and is available in Pro edition only.